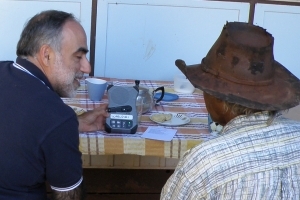 The Saber is a wonderful tool for playing GRN recordings to large groups in remote areas or places with unreliable electricity and little ready cash. 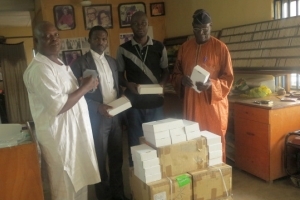 We were excited to send 100 Sabers, hand wind mp3 players with a good loud speaker, to Nigeria in August. We pray that the units will be well used to tell the story of Jesus to people in many remote locations with a great need to hear. Kenya is home to thousands of refugees from Somalia and South Sudan, people who do not speak the languages of Kenya well. Kenya and Tanzania have many remote villages and people speaking a variety of tribal languages who need to hear the Good News in their own language. Our teams in Kenya and Tanzania would love to provide Sabers to Churches and evangelists so they can take a message of hope to people in their own mother tongue. A generous supporter in Canada has offered to match donations up to $3000 to send Sabers Kenya and Tanzania. We at GRN Australia are very thankful to have donations for Sabers totalling $3000 to make the most of this most generous offer and so are excited to be able to send a shipment of 100 Sabers to Kenya/Tanzania. We hope to send the shipment in early October. Having sent shipments of Sabers to Nigeria and Kenya/Tanzania, we would now like to set our sights on Asia. Would you prayerfully consider contributing towards a $5000 project to send 100 Sabers to an Asian nation? This country has a GRN team actively working to record the Good News in very poor areas where the name of Jesus is not known. Sabers would greatly aid evangelists in their work and allow GRN recordings to be more widely used. Please pray for God's provision and that the Sabers would play an important role in establishing God's kingdom in places very resistant to God's word.